EuroRope Marine has implemented ID marking on all KARAT® fibre rope products, both mooring ropes and tails. 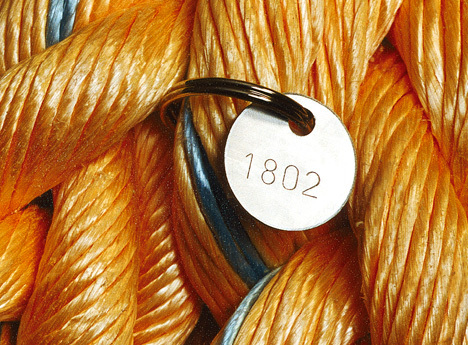 Each mooring rope or tail has a stainless ID-tag with an individual four or five digit number. This number is also endorsed on the corresponding individual works certificate. The ID-tag is located in the splice of the mooring rope or tail (one ID-tag per eye splice). With the EuroRope Marine ID-marking, keeping record of rope performance and age will be an easy task.